Samsung recently launched its new smartphone Galaxy A9 (2018) in India and is now launching Samsung Galaxy A9s in China. According to the official poster launched by the company, this smartphone will be launched on October 24 at 7 a.m. (Indian time at 4:30 PM) during an event in Shiyan. 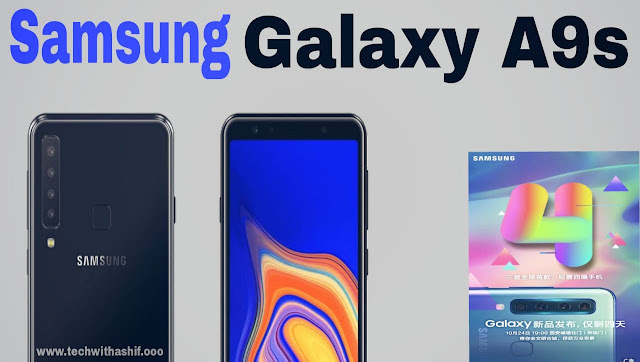 The point of note is that it is the first such handset of the company, which has four rear cameras.Although the company has not made any announcement about the price of this phone in India, but it is expected that this year will be the Galaxy A9s in the Indian market till November this year. This is a great handset for samsung lovers. Galaxy A9 features the world’s first quad smartphone. Samsung A9s also comes with Bixby assistant. 6.3 Inch. Super Amoled Infinite display with 1080×2220 pixel resolution. This smartphone has a 6.3-inch Super Amoled screen with 1080x2220 pixels resolution. It has got 2.2 GHz octa-core Qualcomm snapdragon 660 processor. It runs on the Android 8.1 OSO operating system.The company has introduced variants of 8 and 6 GB of RAM, which has 128 GB internal storage. It can be extended to 512 GB via microSD card. Talking about the camera, a 24-megapixel front camera with f / 2.0 aperture has been given to take selfie. There are 4 cameras (24MP + 10MP + 8MP + 5MP) on the back. These include a 24 megapixel primary sensor with f / 1.7 aperture, 8-megapixel ultra-wide lens and 5-megapixel depth with F / 2.2 aperture.Keeping the security in mind, fingerprint reader has been given in its rear. To give a power to the smartphone, a 3800 mAh battery is provided. Talking about connectivity, it has Wi-Fi, Bluetooth 5.0 and Samsung Pay (NEF). The Samsung Galaxy S5 will be available in just a few minutes, as well as Bixby Assistant. Realme 2 review:Why buy affordable 'noch' smartphones?